Flammable Storage Cabinets and cages are a great way for you to keep your workers safe from flammable liquids. We have cabinets that use either manual or self closing doors (bi-fold available). All are made of sturdy construction and include features such as flame arresters, leak proof sills and highly visible signage. These flammable cabinets meet OSHA and NFPA code 30 standards when used appropiately, providing safe storage and management of your hazardous liquids. Reduce the risk of fire in the workplace and protect both your employees and facilities. 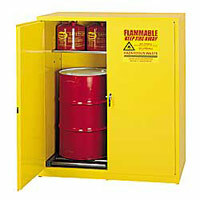 These flammable storage cabinets facilitate your efforts to identify and separate dangerous liquids. The also improve work place efficiency by enabling solvent to be stored near points of use.